The idea for the final project is related to establish a material library in the media lab. The library should givethe posibility to experiance with your hands different materials for your projects. buy, how to use and experiances from people whom have used the material before. For this purpose I want to make boxes in which the materials can be stored. records, how many samples are in the boxes. 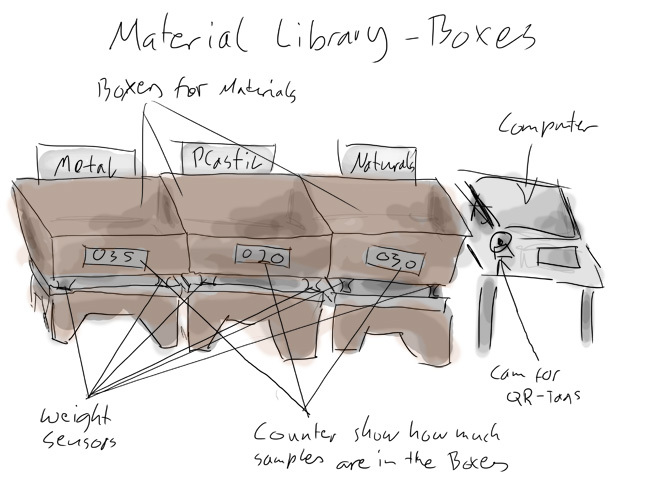 In the sketch there are 3 boxes for 3 different materials shown. Weight sensors messure the weight and the counters show the material quantities. A computer interfaces with websystem/qr. - Arduino interfacing with sensors. - Shopbot machined wood boxes.